Children grow at an alarming rate when your budget is stretched. If kids don't outgrow the clothing the rip or stain the clothes you were hoping would last for a while. These techniques don't all require experienced sewing skills to achieve stretching your children's clothing budget. Mending a child's clothing allows clothes to be worn rather than end up in the rag bag. Learn as you go and you may decide you love sewing and enjoy the ways to save money by sewing. Kids play and they play hard. Along with those scraped knees and elbows are clothing that gets ripped and torn. Learn how to mend clothing and you will make your children's clothing last rather than having a good supply of rags. One of the best ways to prevent stains on children's clothing is to use a bib. You'll find free directions to convert a towel into a fantastic bib, directions to convert a baby blanket into a poncho, free hat patterns and many other free sewing patterns in this list for baby sewing. If you have access to the internet page you are reading and a printer, you have access to free sewing patterns for clothing. 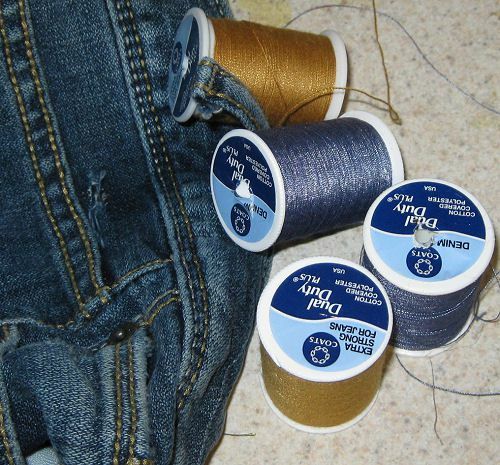 Many sites offer free directions to sew clothing and many have free printable patterns. Children stain clothing and many stains will not come out in the wash. That doesn't mean the clothes can only be worn for playtime and never to be seen in public again. Using embellishment techniques, you may end up hiding the stain and converting a plain, inexpensive tee shirt or ​sweatshirt into "dress-only" clothing. Free sewing patterns and projects really help ​stretch your clothing budget. This list of free children's clothing projects and patterns will have you saving a fortune on children's clothing. Once a child is old enough to hold a needle and thread, without puncturing​ themselves or the people around them, there are ways they can join in the sewing fun. You may be surprised just how much they start taking care of the clothes they sew for themselves. If you've never sewn before, you may be hesitant to start sewing by sewing on a pre-made garment. Learn the basics and be creative with these free, simple, first time sewing projects. You'll be a pro before you know it!